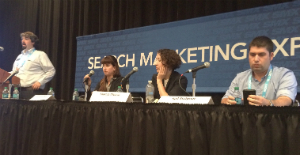 If you have an app, app indexing should be more than on your radar — it should be a practice, according to the speakers of this lively SMX East session. Mariya Moeva, Emily Grossman, and Igal Stolpner all take the stage to offer convincing anecdotes and facts for why you should be implementing app indexing now. They also provide tips on how to do it. 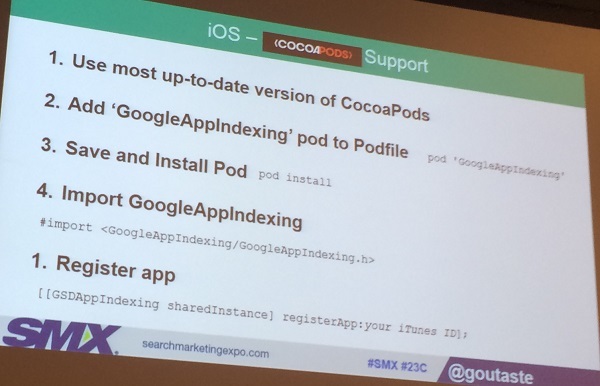 Mariya Moeva: Get Your App Indexed with This One Weird Trick! Here she’ll cover app indexing best practices. She says it will be practical, specific advice for people with apps. Where are we with apps? The progress with app indexing is similar to where websites were in 1999. There are no set standards with apps as we have today, like with HTML and CSS, and we’re learning as we go. Google currently supports deep app links for signed in and signed out users on Android. 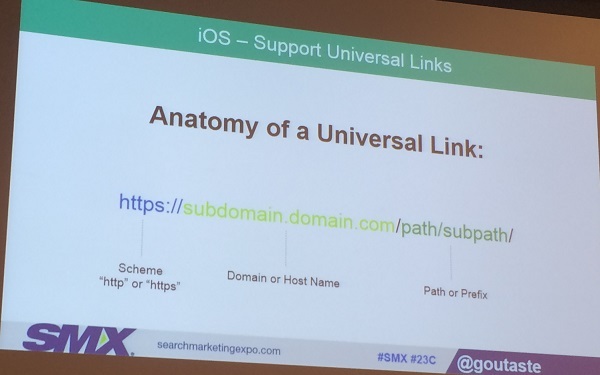 Soon (in October, says Moeva) they will support iOS 9 universal links, and then you’ll see app deep linking in Google Search for iPhones in Safari, as well. Google has indexed more than 50 billion app links, and the number is growing every day. Twenty-five percent of searches on Android return app deep links. Visit g.co/appindexingstudies to see featured case studies. You can read these to ask yourself: does this makes sense to you? Have some accurate KPIs that you can measure so you can see if you’re getting what you want out of it. Use http scheme instead of a custom scheme. Associate your site with your app. You can do this from either Search Console or Developer Console. Publish your deep links. She recommends using the app indexing API to do this. Send a title and description of the page and Google maps it on their end. It’s a simpler implementation and comes with a ranking boost. 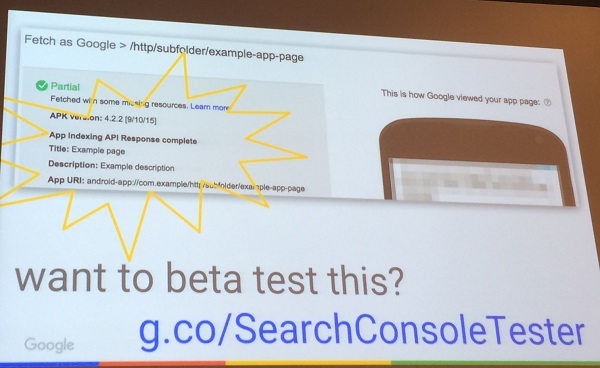 Add your app to Google Search Console. You can see clicks and impressions for your content, as well as queries. You can also be part of their beta test by going here: g.co/SearchConsoleTester. Fetch as Google for Apps. See how your app looks to the Google crawler. You will be able to test changes to your app without pushing it live to Google Play. Google updated its infrastructure so that it can do deep linking for iOS. A year from now, she hopes for a shared standard that we can talk about that gets app content in front of users in the same way we have for websites. The app store model relates to meta data providing a preview of the type of content that’s in the app. Until recently, Google wasn’t able to get inside of apps to understand what’s inside. That’s a problem if you’re Google and your goal is to index all the world’s data. Now rather than an app store model, we’re looking at a search engine model powered by deep linking. A specific URL is assigned to an app screen in either of these ways. 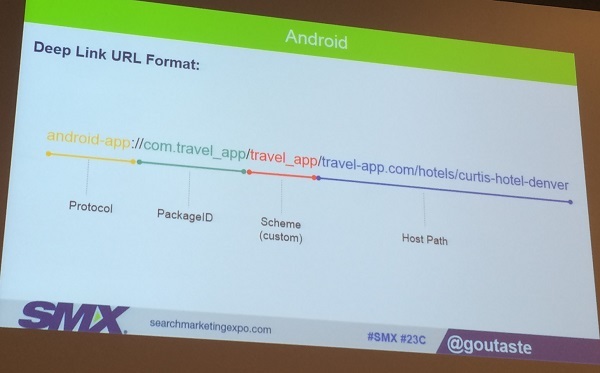 Grossman shows the headline of an article she co-authored on Search Engine Land that explains how marketers can promote their app content in Google Search. Sync your URLs with Google Play Developer Console or Search Console. iOS was added to the developer documentation as of last night. This is very different documentation from any documentation Google’s released before. Adopt an entitlement in Xcode that lists each domain associated with your app. Association file must be hosted on an HTTPS domain. Apple is invested in getting users into apps because Apple’s made $9 billion on the App Store. Apple Search works with a public and private index. Results in Apple Search pull from both. 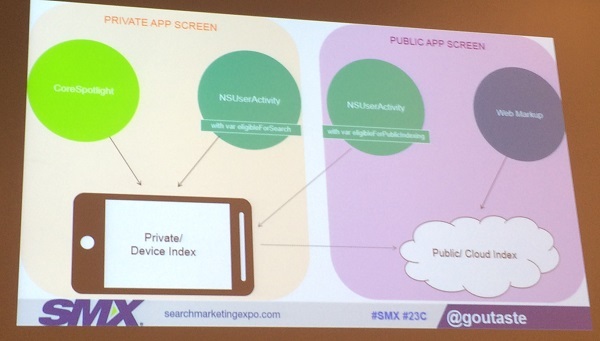 With NSUserActivity, Google won’t put content in the public index just because you say it’s public. They’ll start it in the private index and test it until they feel confident about adding it to the public index. Web Markup is the only option for directly getting it into the public index. Using the App Search API Validation Tool, you’ll find out how Apple sees your app and how it will show up in search results. Stolpner says he just now learned from Moeva that you can soon test an SDK (software development kit) before going live, and that’s a very big thing. Apps offer more technology and features (such as camera, GPS, push notifications, rotation). The brand is one click away. They offer the same content on both apps and their mobile site. They discovered the apps brought more pages per session and more monthly visits per user. Since implementing apps in early 2014, there’s been a drop in the number of non-daily users from 15 to 8 percent. Why aim for app indexing? Competition isn’t there yet (be first on the block). In Google search results, an indexed app appears with its logo. This grabs attention and increases the CTR by 40 percent. Google drives new installs directly from search results. This isn’t at the expense of traffic to the mobile site. Coordinating the work between different teams. Apps are released in versions — everything is slower! Adjusting the app for Google Search. 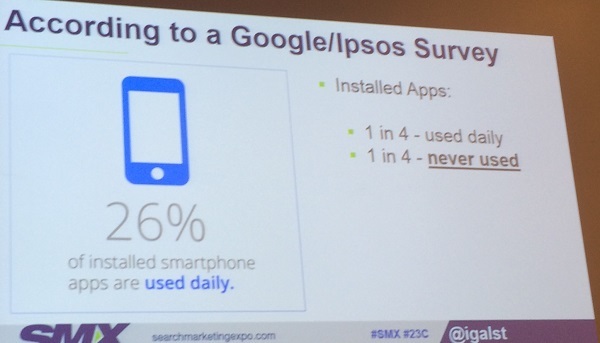 Users coming to the app from Google Search view 20 percent more screens in a session and spend longer in the app. If a user has the app installed, they’re getting higher rankings. For their company, app indexing-related projects became top priority. He suggests that you read the guides carefully. He also notes that the final quarter of 2015 begins tomorrow; invest in deep linking today. Question for Moeva: Can you explain the ranking boost again? If you have web content corresponding with an app page, you get a ranking boost. When you let Google index content using the API, you let Google see what pages of your content users like the most. For those, there’s an additional ranking boost. Is the ranking boost given regardless, or just for high engagement? There aren’t many apps using the API now, and those that are are all high quality, high engagement. As more apps join, they’ll tune and adjust. Search Console shows you everything that happened before a click and the click. Analytics is everything after the click. Together you see the full picture.